The battle to prove you are the team's number one driver can be close. Sometimes too close. 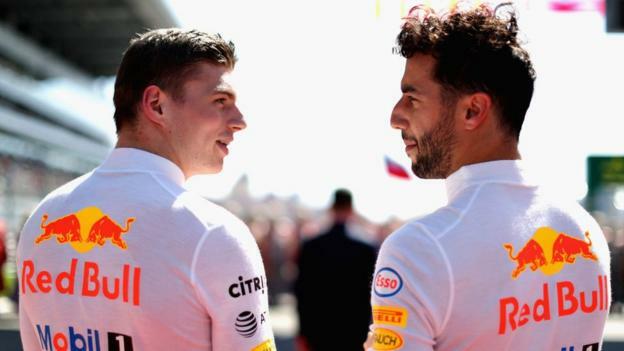 That was the case during last Sunday's Azerbaijan Grand Prix when Red Bull team-mates Daniel Ricciardo and Max Verstappen collided while tussling for a place on the podium, ending their respective races. "I'm OK with Daniel," said Verstappen after the race. "Me and Max love to race, that's cool. It was on the limit," said Ricciardo. Publicly, the relationship between the two appears to be fine - but can it last? BBC Sport takes a look at some other notable team-mate tangles and what happened next. "We've got to sit down with both drivers and make sure that this never happens again." It must feel like deja vu for Red Bull team principal Christian Horner, who said the above when two of his previous drivers collided during a race eight years ago. Back in 2010, Sebastian Vettel and Mark Webber were Red Bull team-mates but their relationship took a turn for the worse when they collided at the Turkish Grand Prix - driving in a straight line, as Verstappen and Ricciardo were - as a one-two finish was firmly on the cards. Horner invited the two drivers over to his house for a night of karaoke and guitar playing in the hope it would bring harmony to the feuding team-mates. However, while an uneasy truce did develop, things would never be the same again. At the time, neither had won a world title, but as 2010 signalled an era when Red Bull would dominate the sport things were never going to go smoothly. Fast forward to 2013 and Vettel - now with three world championship titles under his belt - famously ignored the "multi 21" instruction to not pass Webber at the Malaysian Grand Prix and let the Australian win in a bid for his own crown. Instead, the German instead said over team radio: "Mark is too slow, please move him out of the way." He then took things into his own hands and barged his way past Webber to claim victory. Their time as team-mates ended that year when Webber - empty handed and disillusioned - retired from Formula 1. This is comfortably one of the most well-known on-track clashes involving team-mates in Formula 1. Alain Prost and Ayrton Senna were McLaren's drivers and both going for the 1989 title when they started the Japanese Grand Prix, the penultimate race of the season. Prost was leading the championship, with Senna fighting to take the battle into the final race, and with seven laps to go the Brazilian attempted an ambitious dive up the inside of his team-mate at the final chicane. Prost shut the door and the two collided. If both retired, Prost would be champion but Senna got his car going again and recovered to win the race. He was, however, disqualified for cutting a chicane on his way to victory, handing the Frenchman the title. Their time as team-mates came to an end as Prost left McLaren to join Ferrari in 1990 - but their rivalry continued and once again the Japanese Grand Prix that year saw a coming together between the two on the circuit. This time, Senna turned into Prost soon after the race start, sending both cars hurtling into the gravel trap and out of the contest. As a consequence, Senna became world champion. 1-1. Perhaps it was best they never came as close to challenging each other again. Both would claim one more title during their careers, but they will forever be remembered for the period at the end of the 1980s when they were virtually stuck to one another. They were karting buddies and even raced each other when they were eating pizza, so it seemed that when childhood friends Lewis Hamilton and Nico Rosberg became Mercedes team-mates, they would only want the best for each other, right? It started off well enough in 2013, but once things began to get heated on the track after they were given a title-winning car, their relationship deteriorated, with one of the first big flash points happening at the 2014 Belgian Grand Prix. The two touched on lap two of the race when Rosberg attempted a move on Hamilton, with the disbelieving Briton saying: "Nico's hit me..."
Rosberg lost part of his front wing but managed to plough on and finish second, but Hamilton suffered a puncture in the incident and eventually retired on lap 39. A very strong discussion in the motorhome after the race, followed by Hamilton claiming the title that year. Many more heated moments would follow. There was the infamous 'cap gate', when Hamilton threw a second place cap at Rosberg after victory for the Briton at the 2015 United States Grand Prix sealed another world title. Then there was the coming together at the Spanish Grand Prix a year later when Rosberg closed the door as Hamilton approached with too much speed attempting to take the lead, ending both of their races. By the time they collided at the 2016 Austrian Grand Prix, they were sworn enemies, but Rosberg's world title that year was enough for him and he retired. That was Esteban Ocon's blunt view after he and Force India team-mate Sergio Perez made contact during last year's Belgian Grand Prix. The simmering rivalry between the two had already dashed their chances of a podium at the Canadian Grand Prix and hopes of a top-three finish at the Azerbaijan Grand Prix were also ended when the two collided. But lessons were not learned as neither gave each other space on the run down the hill from La Source to Eau Rouge and the inevitable crash happened. Force India were furious and, after initially letting their drivers race, they said team orders would be imposed after Belgium. The two drivers, meanwhile, accepted the need to talk it out. "I believe a new relationship can start from now and we can work as a team and put the interests of the team first," said Perez in August last year. Since then, so far so good. The pair were retained as team-mates for this season and last weekend Perez secured a top-three finish for the team with a superb third in Azerbaijan.